A cycling tour from Lisbon, the capital of Portugal to the popular region of the Algarve. This special holiday bike tour is situated upon the Atlantic coast and follows the Eurovelo 1 route in places. With varied landscapes featuring spectacular scenery along the way with predominantly northerly winds providing delightful breeze, this route is a wonderful way to see the charming and impressive south western corner of Europe. This tour can also be extended to include the Algarve coast and beyond into Spain. Upon your arrival in Lisbon, we will collect you and take you to your first night’s hotel in the fishing town of Sesimbra just to the south of Lisbon. Setting out from the spectacular Cape Cabo Espichel most of today’s ride is along the limestone cliffs within the Parque Natural de Arrabida (natural park) offering views over the crystal clear waters of the Setubal bay and the Troia Peninsula with its fine white sandy beaches. The Troia peninsula is this day’s cycling tour playground which is reached taking the ferry across the bay right after breakfast. With the sea always very close, you will be passing by the sand dunes and rice fields. After the scenery changing into cork oak forests, you have made it to Santiago do Cacém. This classic town is highly popular with walkers, bikers, cyclists and travellers who want to explore the Rota Vicentina (west coast route) and you will see why. Today's bicycle ride will take you from the interior back to the Atlantic coast. Combining tranquil rural scenery with the surrounding cork oak forests, this cycling experience is serene as you will feel almost alone on quiet roads that pass the regional agricultural towns of Cercal do Alentejo and São Luis. Heading west, you approach the Atlantic again. A popular destination among native Portuguese, Vilanova de Milfontes is a noticeably vivid and lively seaside town where the river Mira meets the ocean. Today's ride is not long and contains several interesting locations, partly off route, but within the Vicentina Natural Park which is the backdrop for this cycling tour. The beaches of Almograve, Cabo Sardão and the natural fishing harbour of Entrada da Barca are well worth a visit and to take in the impressive views of the Atlantic Ocean waves crashing ashore and continuing to shape the Alentejo coast. Today we start a good day’s riding heading further south down unspoiled western coastline of Portugal, with beautiful coastal and agricultural scenery. This is the land of the ‘sweet potato’, frequently offered with octopus prepared in one of many traditional ways. 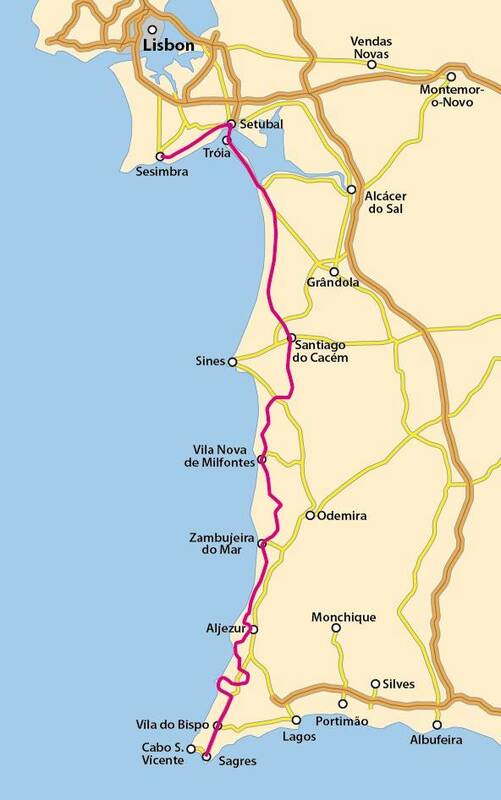 The route includes the transition from the Alentejo province to the Algarve. The two regions are separated by the river Ceixe to be crossed at Odeceixe. The river estuary at the beach, en route, calls for an extra break and is well worth the visit. This day’s ride announces the end of the cycling journey along the Atlantic coast. With the southern Atlantic and its most western cape, Cabo de São Vicente landscape becomes more wild and rugged. The wind-swept plains allow for low and little vegetation as the Sagres peninsula has a micro climate and biological conditions of its own with several endemic species of flora, which makes this last day riding again different from the previous ones. We will transfer you from your hotel in Sagres to Faro airport for your flight home or to a local train station to transfer to Lisbon if your onward flight is from Lisbon. The tour is based upon the Atlantic coast and follows the Eurovelo 1 in places. With a variety of spectacular scenery along the way and backed by predominantly northerly winds, this route is a wonderful way to see the both Lisbon and the charming and impressive coastline of the Algarve. This tour can be extended to include the Algarve coast and beyond into Spain. If you can’t get enough of this region check out our other cycling in the Algarve holiday as well as our great range of cycling holidays in Portugal. Algarve cycling routes may be subject to change or alteration. All route notes, maps and day-by-day information will be given to you upon arrival at the first hotel or at the welcome meeting. GPS/GPX files are available for most of the cycling holidays in Portugal we offer. Please ask us for details. We recommend flying to Lisbon (the largest airport in Portugal) airport to reach the starting point of this cycling holiday. Please use local transport to arrive at the starting point in Lisbon or call us on 0800 755 5385 for more specific travel advice. You do not need to travel by bike to the starting point of the cycling holiday in Portugal as all hire bikes are left at the final hotel. Important: Please book your flights only after the Lisbon to the Algarve cycling holiday has been confirmed by invoice or email. Flights and transfers are not included in the advertised holiday price. The Lisbon to the Algarve cycling holiday includes the daily transfer of luggage to the next hotel and local support if required.